City Law School students, Charlotte Bellamy and Raphael Gray, were winners in the annual Oxford University Press and BPP University Law School national mooting competition 2014-15 held on 25th June. 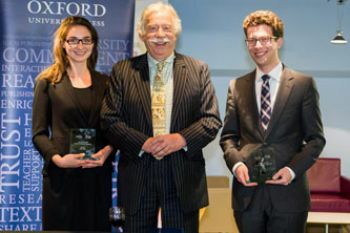 Charlotte Bellamy and Raphael Gray, students on The City Law School's Graduate Diploma In Law course (GDL), won the annual Oxford University Press and BPP University Law School national mooting competition 2014-15 on 25th June. Charlotte and Raphael each won a trophy and £750. They beat out fierce competition from fellow undergraduate and law conversion students studying at Queen’s University Belfast, The Open University and the University of Greenwich. The City team argued a criminal division appeal for their fictitious final moot problem. Judge Charles Gratwicke of Chelmsford Crown Court presided over the final. "It's fantastic to see a City team win this again (the last time was in the 2010-11 competition); Raph and Charlotte have done tremendously well to triumph over some impressive teams throughout the competition, at the same time as completing an intensive year on the GDL at City. Congratulations should also go to their teammates in the early stages: Emily Moore and John Platts-Mills." Non-law students can become eligible for a career in law once they complete a mandatory conversion course known as the Graduate Diploma in Law (GDL), also known as the Common Professional Examination (CPE). The course is conducted over a period of one year and covers the fundamental basics of law and practical skills required to perform well on the ensuing professional course (Legal Practice Course or Bar Professional Training Course) and internship programmes.